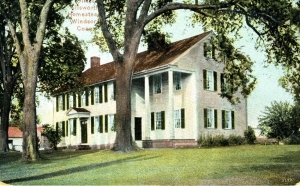 Description: Tinted postcard of the Oliver Ellsworth Homestead, Windsor, CT. This house was built by Oliver Ellsworth (1745-1807) in 1780. Located on Palisado Avenue, it is now owned by the Daughters of the American Revolution, who maintain it as a museum.